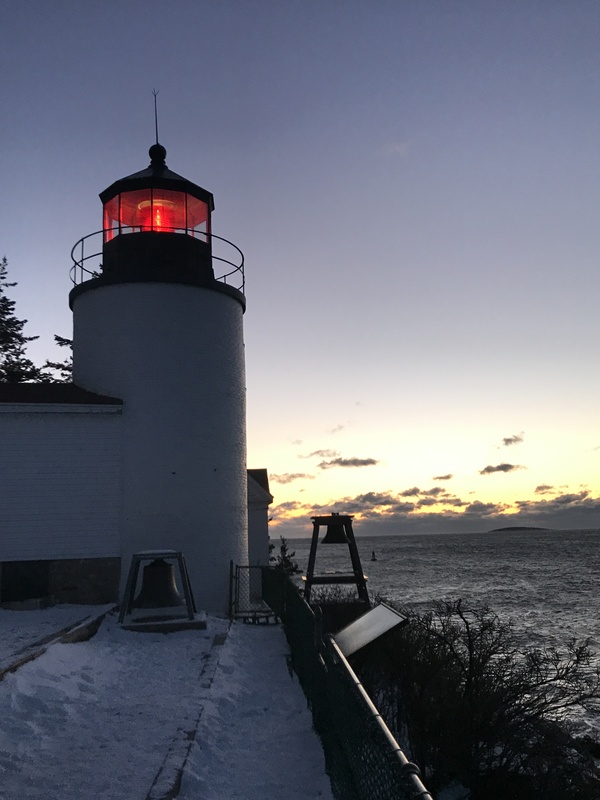 Posted on October 27, 2017 by Karatzas Marine Advisors & Co. The turnaround of the dry bulk freight market in the last eighteen months has been impressive and a welcome reminder that the shipping industry is an extremely volatile business. 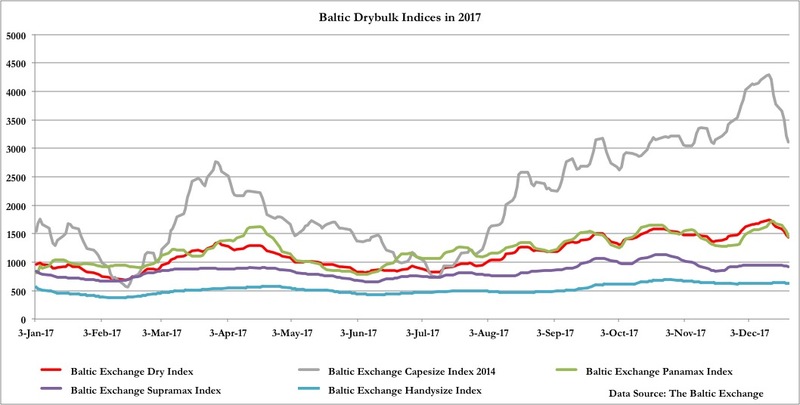 The overall Baltic Dry Index (BDI) has quintupled from March 2016 till now, while more spectacularly, the Baltic Capesize Index (BCI_2014) has decupled in the same period. Still, in absolute terms, daily freight rates are just moving above operating break-even levels, and for vessels with recent or high mortgages, present earnings do not suffice to fully cover the financing cost component of the ownership. Such was the depth (and desperation) of the market that multifold increases in freight rates and barely managing to keep our heads above water! The improvement of the freight market can be attributed to several factors such as delays in newbuilding deliveries in the short term (and precipitous drop in additional newbuilding ordering in the longer term), an accelerated scrapping pace for older and less-than-older bulkers (bringing the tonnage supply and demand balance to a relatively favorable equilibrium), a Chinese economy that keeps impressing with its strong demand for raw materials, miners that keep expanding supply (legacy projects, mostly), new trading routes and patterns expanding ton-mile, and yes, anti-globalization political rhetoric that seems to favor shipping by inserting inefficiencies in the world trade. None of factors above single-handedly has driven the market higher, but all have contributed to a better shipping. As a word of caution, almost all of the above factors are reversible or cancellable on short order, and any thought of popping campaign bottles is premature. And still, there are several additional risk factors that still lurking in the background. In past times, such a strong improvement in freight rates would had set dry bulk prices on fire. Vessels are valued on earnings, and quite often, on expected earnings (which explains, inter alia, how the shipping market finds itself flooded with newbuildings so often); a freight market that has been galloping ahead in the last few months would had triggered major asset appreciation and incited even loftier hopes for higher prices. 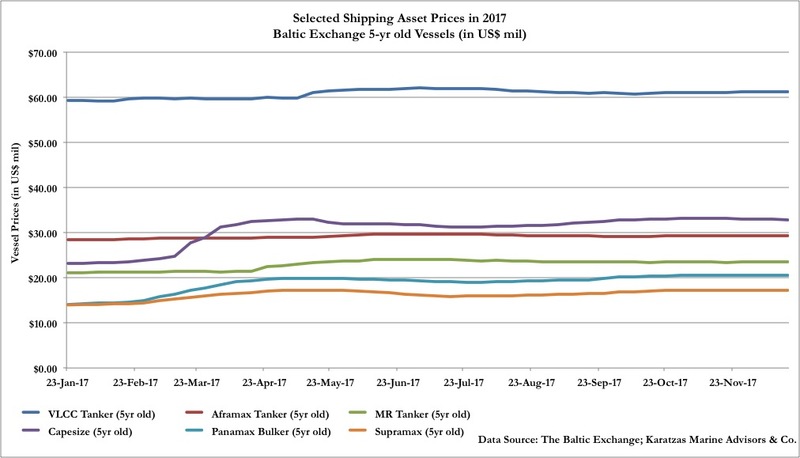 Given that capesize tonnage is the most volatile among the dry bulk sectors, we chose in the following chart to show the Baltic Capesize Index (BCI_2014) and the price of a 5yr-old capesize vessel since January 2015 (data by Karatzas Marine Advisors & Co. (KMA), and the Baltic Exchange to which KMA maintains membership). 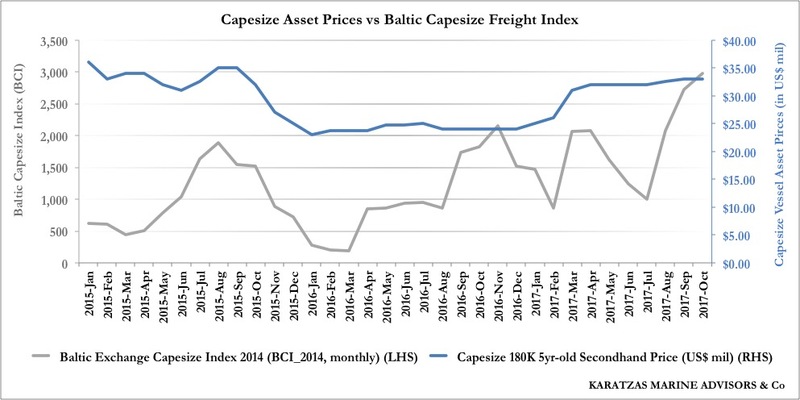 Back in January 2015, capesize prices were overvalued comparatively to the freight market and the index, as expectations and hopes were strong for shipowners to accept lower bids. A further dip where BCI dropped from 500 points to 250 points by early 2016, and capesize asset prices were dropping fast, from almost $38 mil to $25 mil. Since March 2016, the BCI_2014 index has decupled to above 3,000 points at present, but capesize asset prices have only moved up to currently $34 mil for a 5yr old capesize vessel. Quite a disconnect, a 35% increase in asset prices when the freight market is up by a multiple of ten (1,100%). Capesize freight rates (LHS) vs capesize vessel prices (RHS) since January 2015: under-appreciating. Source: Karatzas Marine Advisors & Co. Taking a broader look for other asset classes (panamax dry bulk, ultramax/supramax, and handysize tonnage) in the following graph, a similar trend of improving prices can be seen among all asset classes, in the range of 30-50%. There have been cases when dry bulk vessels were bought at the dark depths of the market in spring 2016 and a year later were flipped by as much as 130% actual profit, but those were few selected transactions, for older tonnage (and different economics and risk), and probably a few of those transactions were opportunistic with an element of luck. The corollaries to the story is that money can still be made in shipping for asset play (“buy low, sell high”) if timing is right, and that when shipowners were pounding the table to raise money to buy cheap ships were correct (but again, many of those owners were pounding the table to buy cheap ships at the peak of the market in 2013/2014). 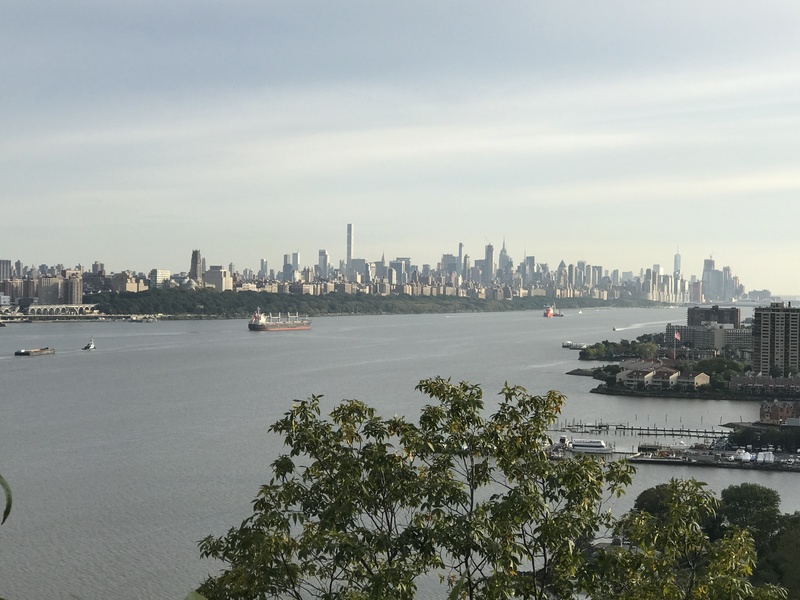 However, the real lesson is that there is a disconnect at present between freight rates today (and also freight rate expectations) and the level of asset prices in the dry bulk market. 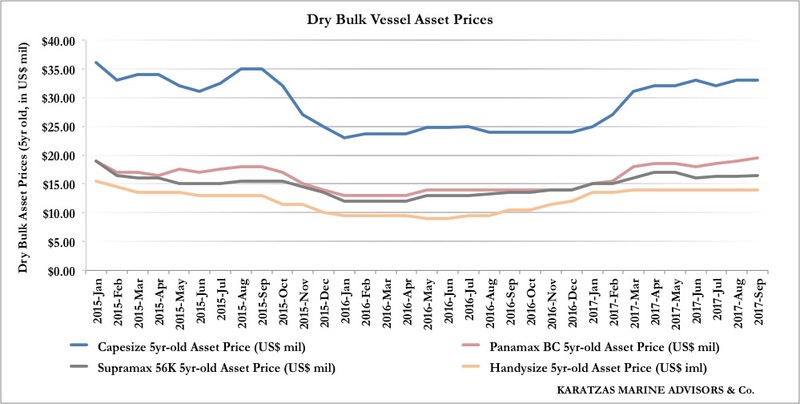 Dry bulk vessel asset prices: hot, but not hot enough. Credit: Karatzas Marine Advisors & Co. Lack of finance is, in our opinion, the real culprit for asset prices not being on fire at present (and this is not necessarily a terrible thing, in our opinion.) Shipping banks have been very tight with new business, capital markets and institutional investors are not perceiving shipping to be an industry of great prospects at the moment, and export credit from newbuilding nations is low on the list. Besides seed equity and selectively follow-ons in the capital markets and anecdotal evidence of ship mortgages from banks, financial leverage in shipping can be obtained from alternative capital funds, at levels that can easily exceed 10%; not necessarily too expensive, but barely sustainable unless one expects a great freight market looking forward. 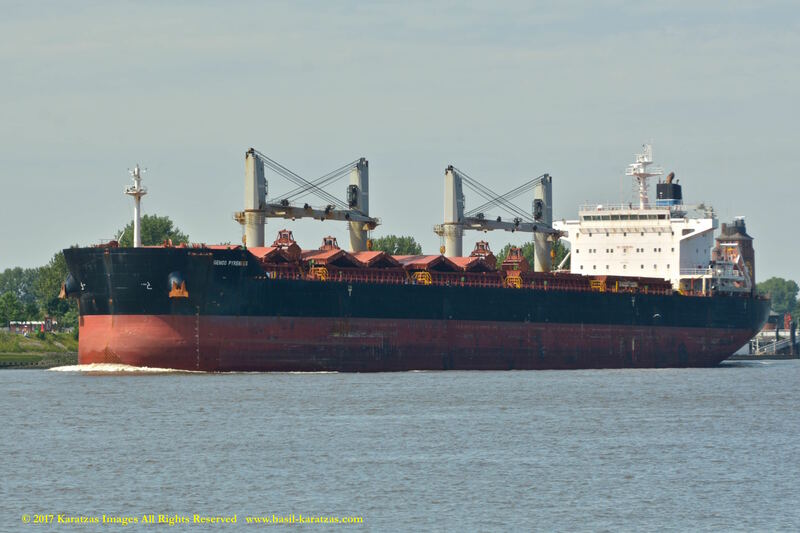 Opportunistically dry bulk is still a great market to enter although the “easy money” has already been made in the early stage of the market bouncing from the bottom. 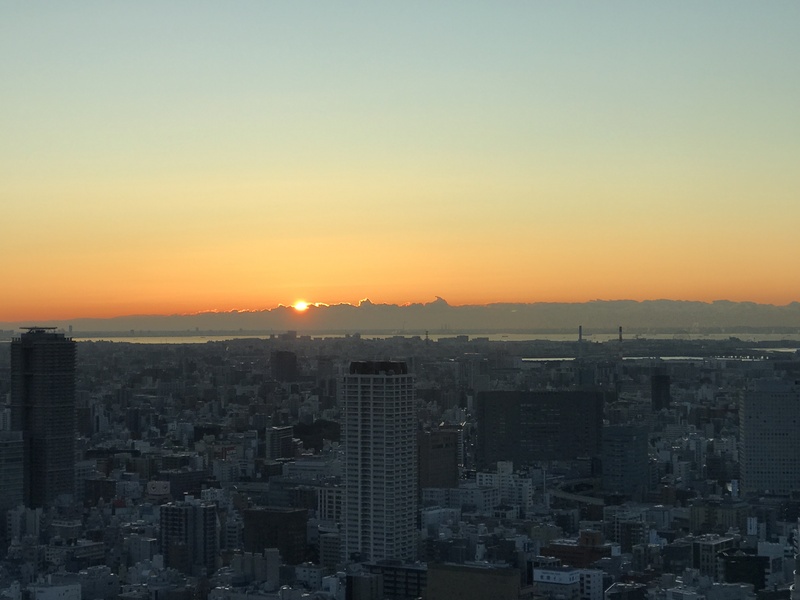 We do not espouse a blind expansion strategy in the sector but there is an arbitrage opportunity for money to be made, especially where investments can be structured to minimize the (many) risks that are still lurking in the background. 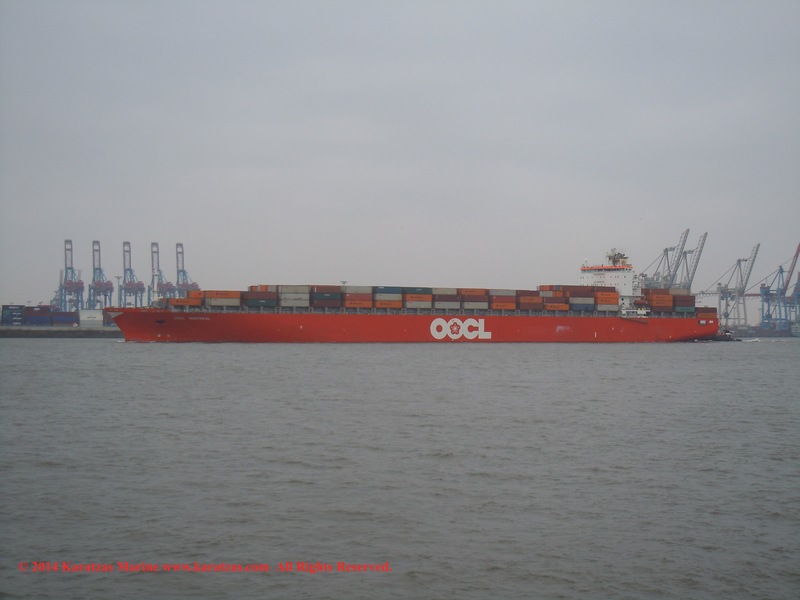 There are still cargoes to be moved worldwide, and contracts of affreightment (COAs) are still available, and strategic partnerships can be set, instead of someone jumping speculatively in the market, even today, when there is the disconnect of freight and asset prices.